Written and directed by Abbas Kiarostami. Starring Tadashi Okuno, Rin Takanashi, Ry Kase, Denden and Mihoko Suzuki. 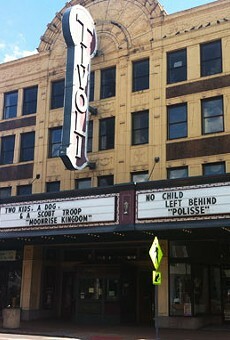 Opens Friday, March 15, at the Tivoli. Like the yearning Jimmy Van Huesen/Johnny Burke torch song that lends it its title, Abbas Kiarostami's Like Someone in Love is a sly, teasing riff on the heart's irrational stirrings. But the film's true spirit is even better encapsulated by "Training a Parrot," an early 20th-century painting by the Japanese artist Chiyoji Yazaki that hangs on the living-room wall in the home of Takashi (Tadashi Okuno), a retired professor who lives a quiet existence of books and seemingly little human contact. On this evening, Takashi's solitary routine is interrupted by the arrival of Akiko (Rin Takaniashi), a Tokyo undergraduate who moonlights as a high-end call girl and who has been dispatched to Takashi by her "employer," Hiroshi, one of the professor's former students. In the painting, a young woman in a kimono is seen teaching an attentive parrot to speak — or perhaps, as Akiko observes, it is the bird who is teaching the woman. Then, in a single elegant shot, Kiarostami frames Akiko in the foreground with the painting directly behind, her pose and manner uncannily duplicating that of the woman on the canvas, as if this century-old work were in fact her own portrait. Which, in Kiarostami's world, could well be the case. Similarly, nothing in Like Someone in Love is quite as it first appears. Twice, Takashi is mistaken for Akiko's grandfather, first by her jealous fiancé, Noriaki (Ryo Kase), and later by a nosy neighbor who, but for a few twists of fate, might have ended up as Takashi's wife. That neighbor even comments on Akiko's resemblance to her "mother" — Takashi's daughte — who, like Takashi's wife, is conspicuous by her absence. Also missing is Akiko's own grandmother, who has journeyed to Tokyo for the day in the hopes of seeing her, but whom Akiko avoids, partly out of shame over her unusual work-study job. And so, without ever laying all of its cards on the table, Like Someone in Love takes on the feeling of a fated encounter between two people who evoke in each other the ghosts of their respective pasts and the possibility of new beginnings. (In addition to Kiarostami's own work, there are strong echoes of Krzystof Kieslowski's masterful Red, in which the meeting of an elderly judge and a young fashion model carried with it the suggestion of an eternal return.) Over the course of the film's one evening and the following day, they cycle through various guises, each filling some mysterious void in the other, before the outside world intrudes, and the spell is broken. It may be a story with special resonance for the disarming Okuno, a veteran stage and movie bit player who, now in his early eighties, is playing his first leading role in a film. He seems particularly attuned to Kiarostami's suggestion that there is no age limit on seduction. "I make one film as a filmmaker, but the audience, based on that film, makes 100 movies in their minds," Kiarostami once told me in an interview. "This is what I strive for," he continued. "Sometimes, when my audiences tell me about the mental movies they have made based on my movie, I am surprised, and I become the audience for their movies as they are describing them to me." Like Someone in Love is a film made wholly in this spirit. It adheres to an emotional rather than narrative logic — and if few would rush to compare Kiarostami to more overtly "dreamlike" directors such as David Lynch or the late Raul Ruiz, he is every bit their equal in his fluid, freely associative sense of cinema. You emerge from Like Someone in Love elated and slightly dazed, not least because of Kiarostami's decision to end the film with the most abrupt denouement since the final episode of The Sopranos. (One working title for the movie was none other than The End.) But the movie's sense of immutable desire resonates well after the lights have come up, as we continue to wonder whether the woman has been teaching the parrot or vice-versa, and if we have been witness to a love story or merely something like it.